I don’t know about you, but I dislike the word ’strategy’. It’s right up there with ’skill sets’, ‘engagement’, ’synergies’ and ‘leverage’, words businesses often use to invoke and associate with the idea of higher thought. With Search Engine Strategies San Jose, the world’s largest search marketing conference upon us next week it occurs to me that the show has devolved to tactics, not strategy - and that needs to change. The tactics used to successfully attack paid and organic search *are* important, but can I please get a ‘whoop whoop!’ from attendees who will high-step it out of *any* session whose panelists talk about keyword generation, campaign structuring and ROI-based management as if those were strategies and not just tactics we’ve all learned about, implemented and lived by since the Long Tail was 100 keywords? Strategies are overall plans to win the battle before it is fought, and tactics are the activities we engage in to implement our strategy. Panelists, vendors, consultants and engine folk, let’s admit it - in our haste to secure our piece of this rapidly expanding pie, we have turned this conference and others like it into a glorified feeding frenzy where insiders position tactics as unique insight, features as solutions and experience as vision. Strategy really matters now. 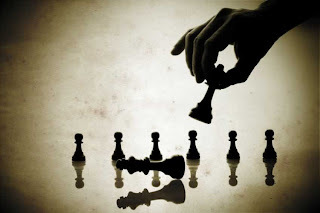 Like you, your competitors have learned the tactics and implemented them. They too have seen the growth, the ROI and the measurability of search - and they want more just as badly as you do. Sheer effort still distinguishes some from others, but that same sheer effort eventually takes a 40% pay raise from a competitor, leveling the playing field right quick. The engine duopoly, meanwhile, is wringing more money out of advertisers by pushing gratuitous, default campaign settings, silo’d SEM mindsets and self-serving system optimizations. It’s no wonder most advertisers are seeing diminishing returns. And last, the SEM vendors, oh the SEM vendors. They've scored easy VC money with visions of a $100M+ exit, and then thrust features that only serve to guide advertisers down a path of strategic myopia. Have you met many SEM vendors who want you to invest towards becoming an effective multi-channel marketer? Do they entice you with Google Maps mashups, no-work-required deployment pipedreams and avoidance of the API costs you will soon bear? Do they want you to play a defensive Quality Score game rather than a multichannel offense? Omniture, a firm whose SEM stance even I once scorned, has arrived with a strategy and accompanying technologies and services that can inform and enable your own strategy. Come join us next week at the sessions Ron Belanger and I will participate in - or at our booth - and we’ll look forward to talking… Strategy with you.